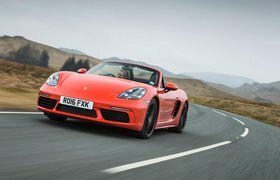 2018 Porsche Boxster GTS review - price, specs and release date | What Car? The Porsche 718 Boxster. Never has a car split opinion quite as much in the What Car? office. We certainly all agree it's fantastic to drive and a brilliant sports car, but we're divided on that four-cylinder engine. For some, it represents progress, but for others it just can't replicate the tuneful six-cylinder engine of the 718 Boxster's predecessor. All of which means this new range-topping GTS is going to be no less controversial. 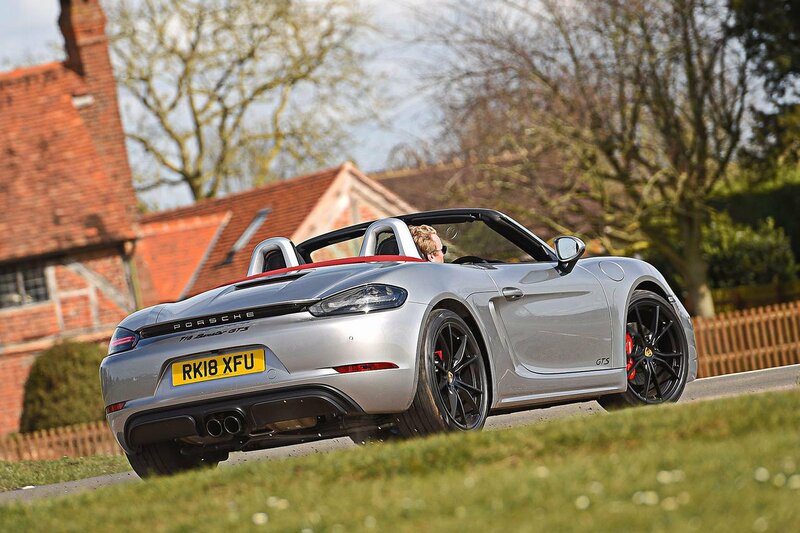 For around £8000 more than the Boxster S, you get a tweaked version of the same 2.5-litre flat four engine (you’ll have to wait until the Boxster Spyder arrives later this year for a six-cylinder model), detailed upgrades to its chassis and a host of aesthetic changes. Those include black plastic skirting, dark 20in alloy wheels borrowed from the 911 Carrera, tinted lights and Alcantara interior trim. Let’s start with the elephant in the room: that engine. Power from the 2.5-litre flat four has risen to 361bhp and torque is now rated at 317lb ft, thanks to a more voluminous air intake and a tweaked turbocharger. The results are respectable but not headline-grabbing 15bhp and 7lb ft increases over the Boxster S. Those outputs are also 26bhp and 37lb ft more than those of the naturally aspirated previous-generation Boxster GTS. Now, without testing the GTS back to back with the S model, it’s difficult to determine just how much quicker the new model is in a straight line. However, what is immediately noticeable is that its power delivery is more linear, thanks to the revised turbocharger. In Sport driving mode, the engine is wonderfully responsive from low revs and is immensely flexible in the mid-range, exhibiting no flat spots. And despite the fact that the engine still sounds somewhat industrial, the larger air intake at least generates a more tuneful sound. All of this is good news, of course, because not only does the increase in torque help mitigate the effects of the Boxster’s overly long gearing, but it also gives you more opportunity to exploit one of the most biddable chassis on sale today. 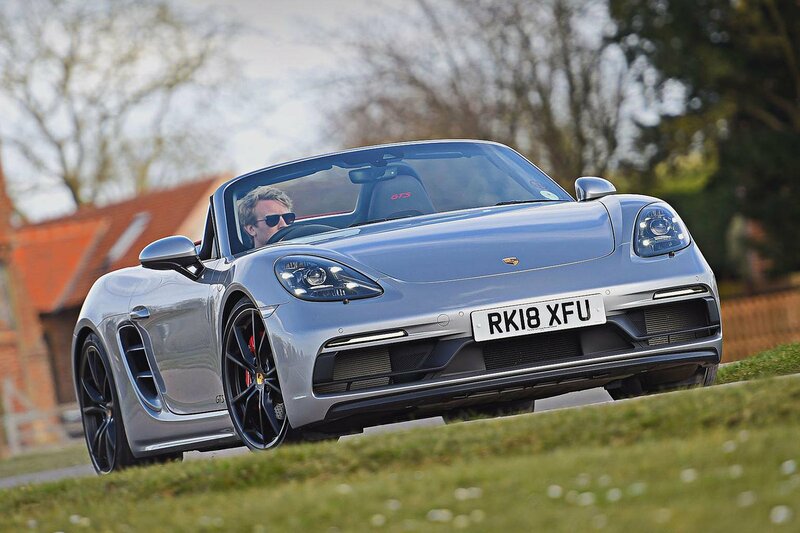 With a new mechanical limited-slip differential, you can confidently tease the Boxster into a rear-led stance on the exit of second and third-gear corners, while standard torque vectoring (which can brake an inside wheel to help get the car turned in) gives you the confidence to attack tight hairpins with gusto. And somewhat surprisingly, a 10mm drop in ride height (or 20mm if the Sports Chassis option box is ticked) does nothing to ruin the ride. With the car in Sport Plus driving mode and the dampers slackened off via a button on the centre console, the Boxster can cover ground at a rate that would trouble the 911 Carrera, such is the suspension’s ability to soak up battered bitumen. It’s a truly remarkable feat, especially when you consider it’s riding on hefty 20in wheels. So really, the only choice you need to make when speccing your GTS is whether you go for a six-speed manual or seven-speed dual-clutch automatic gearbox. The latter drops the 0-62mph time (4.6sec for the manual) by three-tenths and is astonishingly quick at swapping cog, but the manual is 30kg lighter and has one of the most accurate and satisfying throws of any ’box on the market. And don’t worry about having to heel and toe like Walter Rohrl, because the manual has a rev-matching function, too. All told, the Boxster GTS is a joy to drive, feeling more dynamically complete than rivals such as the Jaguar F-Type Convertible and Audi TT RS Roadster. As well as the power increase and chassis tweaks, GTS buyers are treated to a beautifully finished interior that perfectly complements the darkened exterior. A pair of electrically adjustable, Alcantara-trimmed sports seats dominate the interior and are fantastically supportive, while an Alcantara-wrapped three-spoke steering wheel and gearknob give plenty of grip. All GTS models come as standard with the Sport Chrono package, which adds not only a stopwatch on top of the dashboard but also a small rotary dial on the steering wheel for selecting the various driving modes. GTS-badged Boxsters also get Porsche Communication Management and its 7.0in touchscreen as standard. It’s a quick and logically laid out system, if not quite as intuitive to use as the rotary dial-controlled units from Audi and BMW. 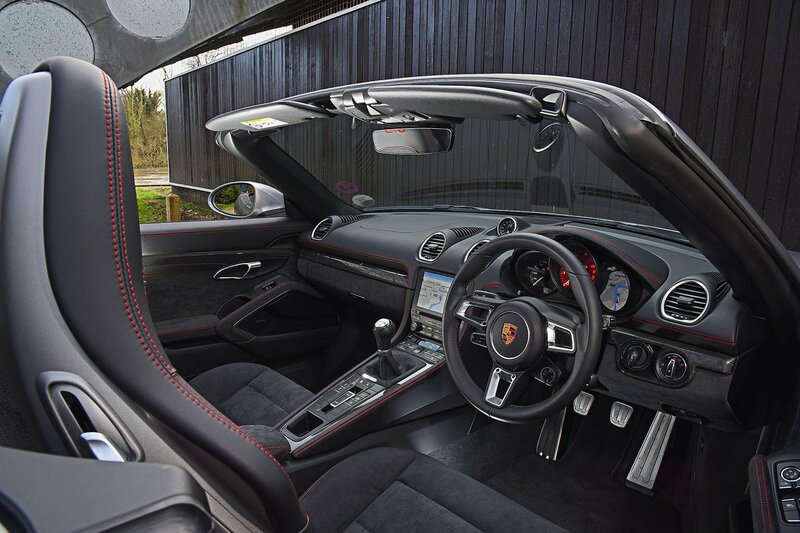 For a full breakdown of the Boxster's interior, head over to our in-depth review.